HFSC Spokesperson Ron Hazelton (left) and HFSC founding members at the side-by-side burn demonstration at the NFPA Conference & Expo in June 2016. In the mid-1990s, fire data from the past few decades had proved that people were dying at the highest rate in the place where they felt safest, in their own homes. Home fire sprinkler education materials from the national fire service were limited and most fire safety education programs focused on smoke alarms and escape plans. Even though home fire sprinklers were the simple solution to the home fire problem, movies and television shows incorrectly portraying fire sprinklers all activating at once led to an unappealing view of home fire sprinklers for homebuyers. Seeing the need for a single trusted source of noncommercial educational information about the dangers of home fires and the unparalleled life-safety benefits of installing home fire sprinklers, the American Fire Sprinkler Association (AFSA), National Fire Sprinkler Association (NFSA) and National Fire Protection Association (NFPA) founded the nonprofit Home Fire Sprinkler Coalition (HFSC) in 1996. 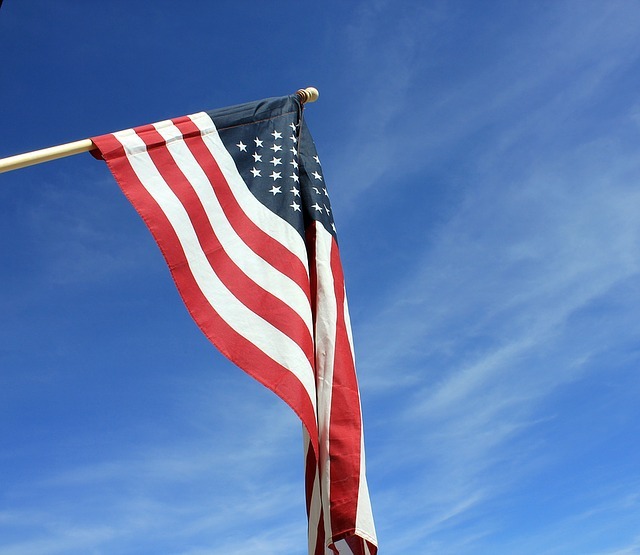 “The formation of HFSC proved that organizations that sometimes have competing interests can come together to promote common goals,” says AFSA President Steve Muncy. 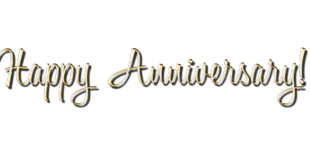 Twenty years later, HFSC is now the collective voice of its three founding board members and the Canadian Automatic Sprinkler Association, FM Global, International Association of Fire Chiefs, National Association of State Fire Marshals, National Fallen Firefighters Foundation, National Volunteer Fire Council, Phoenix Society for Burn Survivors, State Farm Insurance, UL, and the U.S. Fire Administration. “None of us could do this alone. Everyone brings their expertise and insight to the table allowing HFSC to maintain its credibility as the only national organization that focuses solely on educating consumers and all the other stakeholders about home fire sprinklers,” says HFSC President Lorraine Carli. 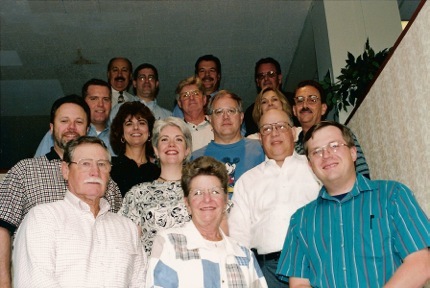 Members of HFSC in its early years, including Janet Knowles and Steve Muncy, representing AFSA. As home fire sprinklers have become more of a reality in communities across the U.S. and Canada, with requirements for fire sprinklers in new homes in California and Maryland and hundreds of individual communities, the need for accurate facts and education is just as important as ever as more people are exposed to the often-misunderstood technology. The fire service has been a tremendous partner by communicating home fire sprinkler messages to consumers and distributing HFSC’s educational materials. As the coalition grew, the commitment deepened to include the Built For Life Fire Department (BFLFD) program to increase the number of fire departments making home fire sprinkler education a focus in their service areas. The BFLFD program now totals over 2,600 member fire departments in the U.S. and Canada. 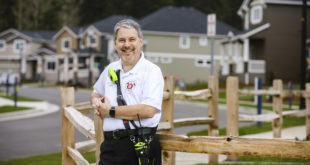 Members of the grassroots program are progressive fire safety educators and have taken advantage of HFSC’s grant-funded programs and free resources. Through 10 years of FEMA Fire Prevention & Safety Grants, HFSC has educated and expanded its target audiences through the printing and distribution of educational brochures and videos, attendance at trade shows and conventions, and television. 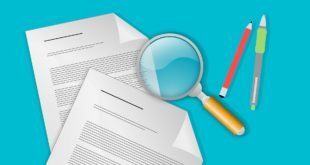 After initially targeting consumers and the fire service, HFSC has widened its educational outreach to homebuilders, real estate agents, insurance agents, water purveyors, building officials and local decision-makers. But one of the greatest and most successful programs that came about from grant money, which has continued to flourish, has been the side-by-side fire and sprinkler burn demonstration concept. With grant money, HFSC was able to create a side-by-side demonstration guidance kit, which provides fire departments with all the instructions to carry out such a demonstration, and offer stipends to dozens of BFLFDs nationwide. Using stipend money to build the demonstration units, BFLFDs have been able to show their local communities the difference between fires in sprinklered rooms versus unprotected rooms. The demonstrations are the most powerful and effective home fire sprinkler public education tools available as they allow audiences to feel the extreme heat and see the quick growth of a fire to flashover in the unprotected rooms and see the quick response and cooling action of fire sprinklers in the sprinklered rooms. Through the stipend programs, HFSC’s fire sprinkler message has been able to trickle down to the general public in local communities and has often led to media coverage in local newspapers and television outlets. 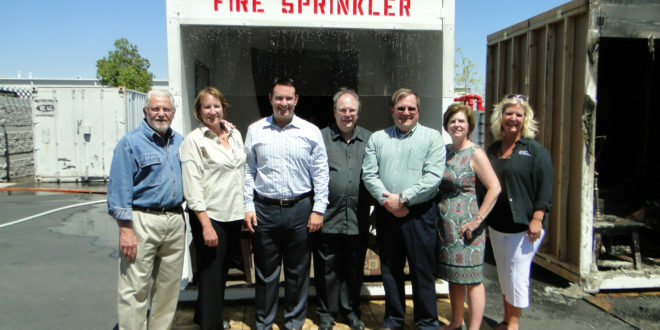 The grassroots side-by-side stipend program has provided local communities with exposure to home fire sprinklers that would not be possible without the assistance of BFLFDs. 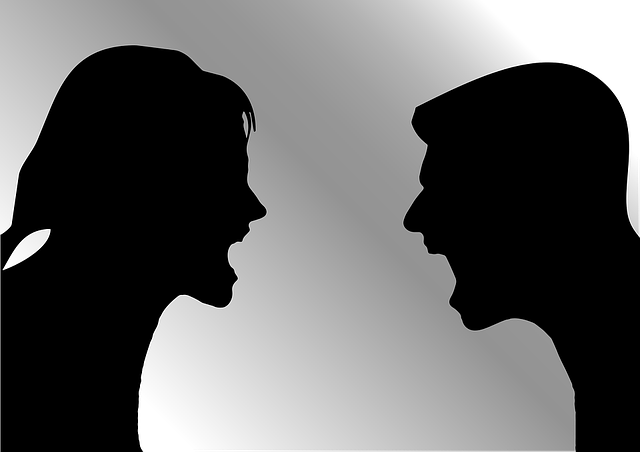 Often using the side-by-side demonstrations as the focus, HFSC itself has had significant success with media on a national level. Since its early years, HFSC has paired with improvement expert Ron Hazelton, former editor for ABC’s “Good Morning America,” as the spokesperson for HFSC educational videos. Working with Hazelton has led to stories and demonstrations on “GMA,” but also dozens of segments at television affiliates nationwide and on other national morning talk shows. 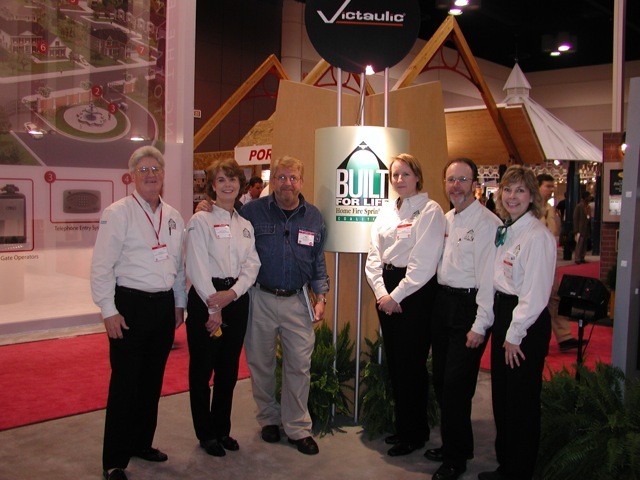 Exhibiting at the 1996 International Builders’ Show, from left to right: Jim Dalton, Janet Knowles, Ron Hazelton, Peg Paul, Steve Muncy, and Julie Reynolds. “Ron is a true advocate for home fire sprinklers. He has helped us reach millions of people,” states Carli. She notes that Hazelton has even retrofit his own home with home fire sprinklers. Just recently at the NFPA’s annual Conference & Expo in Las Vegas, he narrated a side-by-side for attendees as part of HFSC’s 20th anniversary celebration. The next day, Hazelton spoke with major television markets as the side-by-side video footage was broadcasted to them. In order to continue being as effective as possible, the evolution of HFSC’s education materials has been a necessary constant. Some early users may recall bulky box kits with VHS tape videos; those were later replaced with brochures that contained DVD sleeves. In addition to DVDs and brochures, all of HFSC’s free-of-charge educational materials are now being made available as free downloads through its website. In fact, HFSC just completely renovated its website, homefiresprinkler.org, in order to make it more user-friendly for the growing number of consumers using mobile devices such as smartphones and tablets. HFSC’s entire comprehensive library of downloadable teaching tools are available at visitors’ fingertips and navigation is easier than ever with specific information for each target audience. 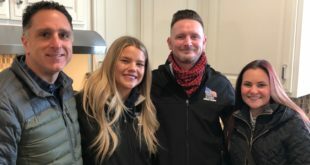 ABOUT THE AUTHOR: Erik Hoffer is a writer for Frankfort, Illinois-based Peg Paul & Associates, writing on behalf of fire sprinkler advocacy and fire safety organizations such as the Home Fire Sprinkler Coalition.